Posh midfielder Chris Forrester takes the long walk of shame after being sent off at Barnsley. Photo: Joe Dent/theposh.com. The 10 men of Peterborough United came agonisingly close to claiming an excellent point at Barnsley tonight (April 19). 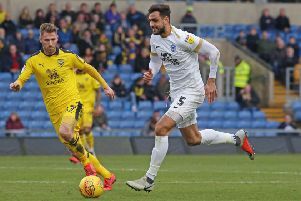 Posh survived at 0-0 with a man down for 50 minutes until an injury-time header somehow squirmed past Ben Alnwick. Marcus Maddison in action for Posh at Barnsley. Photo: Joe Dent/theposh.com. Jon Taylor in action for Posh at Barnsley. Photo: Joe Dent/theposh.com. Leo da Silva Lopes: (for Santos, 90 mins).